I love having this blog because it gives me the opportunity to express myself. And, putting paper cut-outs of rock stars on my beaded love seat is just one way to do that. You see, I’m a stagehand, and I’ve worked all of these artists’ shows at least once – and in Ozzy‘s case, many times. This piece of beadwork is giving me the opportunity to show you how I think and envision things…Afterall, that is the purpose of art, correct?? My next question is, what do you suppose Ozzy‘s thinking as Prince is sitting beside him strumming a guitar?? >Coming from one of the biggest Prince fans out there, I LOVE THIS!! It’s funny because I think of it as a little story of my own musical life. My dad loves Sabbath, I love Prince. It’s like I’m the one sitting on the couch as Prince trying to convince my Ozzy father that my music is cool. You are awesome!! 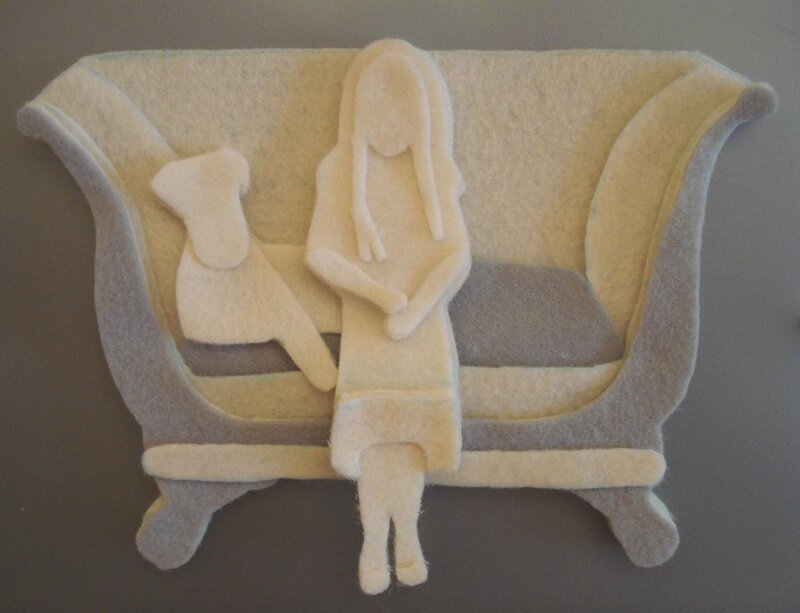 >I haven’t checked your blog since the summer, and boy I think I have been missing out!You are cracking me up with your loveseat photos and the musician cut outs that sit in it…I won’t be away so long next time! >Wonderful work! So perfectly executed. >What I really love is the idea of the sloping curved arm you are getting on your couch with the different colors of beads. Go Girl! >Hey Lone Beader! Thanx for the comment! I’m a big OZZY fan, but I think his thoughts are very limited these days…whatever it is I’m sure he’s dropping F-bombs every other word! Gotta love him! >I coulda had a V8?Where’s my Raspberry Beret . . . I think I looo-ove you . . . hee hee hee.i went DOH Tues morning when I realized I’d missed your class. Dangit.